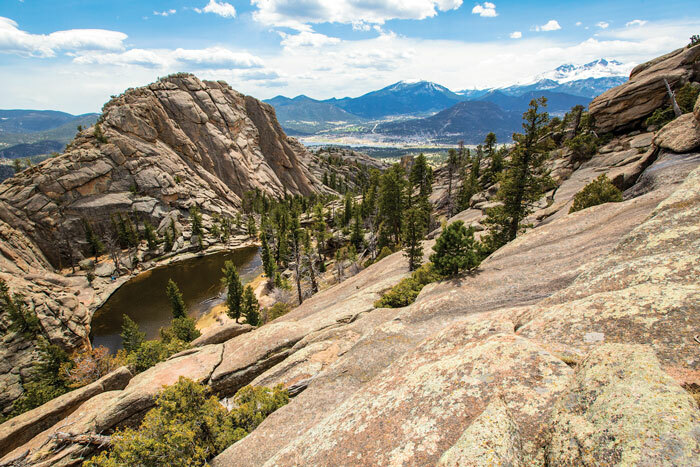 Forty miles south of Estes Park along the Peak to Peak scenic byway, sits the small mountain town of Nederland, Colo. Nicknamed “Ned.” The town has a long and rich history as a mining settlement since its beginnings in the 1800s. 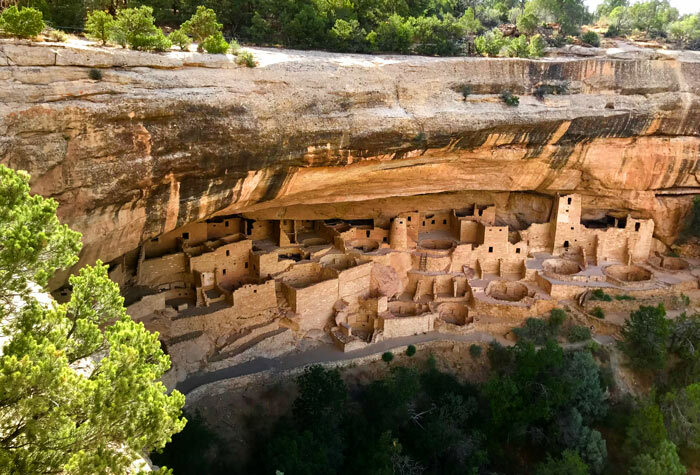 However, today Ned is known as a quirky town with plenty to do—the perfect place for a day trip from Rocky Mountain National Park. 1. On your way down to Nederland, take the Peak-to-Peak Scenic byway for stunning views. From Estes Park, take Hwy 7 and then a right on Hwy 72 to Nederland. It’s about 41 miles to Nederland and takes around an hour, but you will not be disappointed. If you happen to be visiting during the fall, you’ll get to see a spectacular display of fall foliage in the mountains. Sunset over Nederland from Barker dam just outside of town. 2. Pick up coffee and breakfast at one of the town’s many coffee shops. Try New Moon Bakery, Salto Coffee Works, or one of the others that you can find in town and grab a pastry or breakfast sandwich and enjoy sitting at their patios in the morning sunshine. 3. Go for a hike to a high alpine lake. Diamond Lake near Nederland, Colo.
Nederland is home to an endless amount of great hiking trails—many that end at crystal-clear, cold and beautiful mountain lakes. Hessie Trailhead, a popular destination right outside of Nederland, offers several different hikes. From town, head south on Hwy 119/CO-72 and then turn right onto Eldora Road, take a slight left onto Eldorado Avenue and then continue straight onto Hessie Road. From there you can park and begin hiking at Hessie Trailhead or continue onto Fourth of July Road to reach many other trailheads, such as Lost Lake, King Lake, Woodland Lake or the Diamond Lake trails. All of which offer beautiful views of U.S. Forest Service Lands and the Indian Peaks Wilderness. In the summer this area gets pretty busy and congested. If you plan on driving to the trailheads, national forest rangers recommend you get there early in the morning—before 8 a.m. if you want to find a parking spot easily. Just make sure you park between the “Park Only” signs or you risk getting a $50 fine or towed! If you get there later in the morning or just don&apos;t feel like driving, there is a free shuttle service that is available during summer weekends from the beginning of June to October. It picks up hikers at the Nederland RTD Park-N-Ride beginning at 8 a.m with shuttles picking up every 15-20 minutes. You can even bring your pooch on the shuttle and trailhead, just as long as he or she is leashed. For a hike that is a little more out of the way, head 7 miles south of Nederland on Peak-to-Peak Highway until you get to the tiny town of Rollinsville, Colo. Take a right turn on Main St/E Portal Road and stay on the dirt road for 8 miles until you reach the parking lot in front of Moffat Tunnel. From there, there are several trails to take. I recommend the Crater Lakes trail. A moderate hike, the trail will take you up to two beautiful, side-by-side lakes nestled in a high-alpine valley. A heads up though—this hike usually stays a little wet and muddy until mid-July because of snow melt so make sure to wear your hiking boots or at least a good pair of tennis shoes that you don’t mind getting dirty. If you’re feeling adventurous take a dip in one of the lakes! 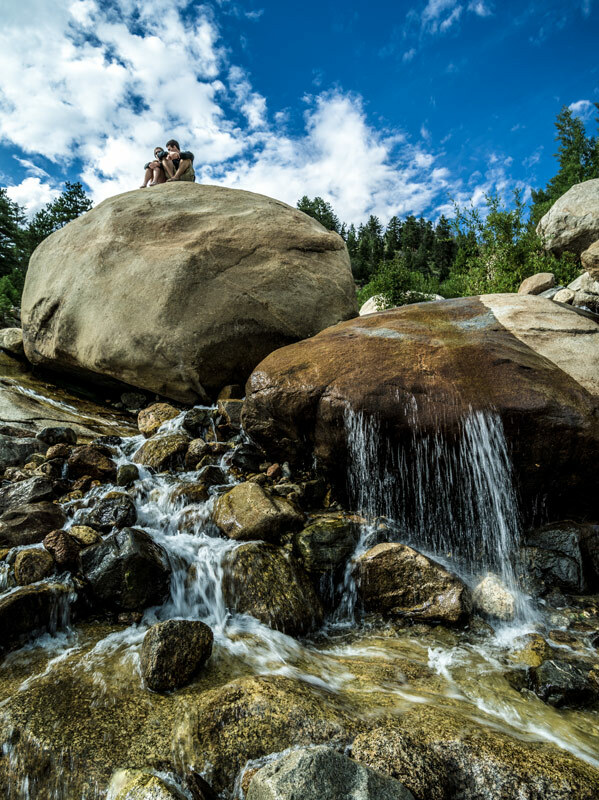 While it may be cold, there’s nothing more refreshing than a dip in a clear lake after a hike on a hot day. While these hikes are definitely doable for families with younger children, there are several more mellow options if you’re looking for something easier. Mud Lake and Caribou Ranch open spaces are good for families. There are covered picnic areas, restrooms and dogs are allowed to be there as long as they’re leashed. There are short and easy hikes available—some of which even strollers can be pushed on. Grab lunch or dinner at a local favorite like Crosscut Pizzeria & Taphouse. Opened in October 2015, the pizza joint has quickly become a popular favorite. Everything at Crosscut is made from scratch, and their artisan, wood-fired pies are absolutely amazing. Their menu consists of many year-round items, with some seasonal items as well as an awesome selection of craft beers and a house made root beer on tap. If you stop in, try the locals favorite—the Extra Special Cheese with Applewood-smoked bacon and jalapeños or Shisito peppers appetizer. Or try something more seasonal, like the Capri pizza or Caprese salad. If you’re not in the mood for pizza, try out another Nederland restaurant like the Rocky Mountain Oyster Bar for New American cuisine or the James Peak Brewery & Smokehouse for craft beer and barbecue. This historic carousel is the perfect activity for the whole family. The Carousel of Happiness is located at the edge of the town supermarket’s parking lot, next to the historic Train Cars. Hop on for $1 and admire the 56 hand-carved animals that adorn the restored 1910 Loof Carousel. Vietnam veteran and Nederland local Scott Harrison purchased the carousel in 1986 and spent nearly 26 years hand-carving all the animals that are on the carousel. His inspiration? A music box that he carried with him while in Vietnam which helped keep him distracted and calm during the war. The carousel has been open since 2010 and is perhaps Nederland’s best treasure. Inside one of the three cars at The Train Cars Coffee & Yogurt Company. Right next to the Carousel of Happiness is the Train Cars Coffee & Yogurt Company. The business is housed in three train cars that have quite the histories. One of them was a circus car that toured with Buffalo Bill’s Wild West Show! Grab coffee, dessert or food and learn more about the cars. The museum, run by Boulder County Parks & Open Space, is free admission and has information on the mining heritage of Boulder County and the surrounding areas. The museum features old, historic mining equipment and information on hard rock and placer mining as well as a metal basin where you can try your hand at panning for gold. The museum also has plenty of programs where you can learn more about the history of mining and the town of Nederland. Visit the website for up-to-date info on events. The town of Nederland is small enough to be able to park your car and walk everywhere. Stroll through town and stop in the many small boutiques for clothing, jewelry, art and more. Stop in Nature’s Own and check out their large collection of gemstones and get a unique gift. Or stop in the newly opened Ned Native’s store and check out art, gifts and housewares from local artists. Nederland has its fair share of music festivals and farmers markets. Head to Frozen Dead Guy Days in March for three days of music and fun! The festival celebrates Bredo Morstoel, the “Frozen Dead Guy,” who is frozen on dry ice above the town of Nederland. Morstoel, a native Norwegian, died in 1989 from a heart condition upon which he was packed on ice and sent to the Trans Time cryonics facility in Oakland, Calif. In Oakland, he was placed in liquid nitrogen for around four years before his body was moved to Nederland in 1993 where his daughter, Aud, was living. Aug kept her father in a shed behind her house and while it is illegal to store any type of body in Nederland, the town made an exception for Bredo Morstoel. The town has now loosely celebrated the frozen man every year since 2002. If you don’t want to brave the cold, head to Ned Fest, a music and arts festival, in August. Enjoy microbrews, mead, camping and music all at this small festival! Or stop by the once monthly Sunday farmer’s market during the summer months between May and October for local produce, food, arts and crafts, jewelry, live music and more! Located in the middle of town next to the RTD Park-N-Ride, the visitor center is good place to stop for the most updated information and current events. Purchase gifts, pick up some free information—or sign the town guest book!